Dubai: A new mall with 2 million square feet of leasable area has been announced, located within the sprawling MBR (Mohammad Bin Rashid) City. To feature over 750 outlets, the mall is located at the intersection of Umm Suqeim Street and Al Khail Road. Scheduled for a late 2019 opening, the Dubai Hills Mall is a joint venture between Meraas and Emaar Properties. The two master developers are already associated with the high-end Dubai Hills Estate community that is taking shape. The mall as well as the earlier announced Meydan One destination represents the spread of Dubai’s retail capacity from Burj and the Downtown area into the newer parts of the city. Within MBR City itself, a slew of residential offerings are being created, and which the new retail spaces will tap into. 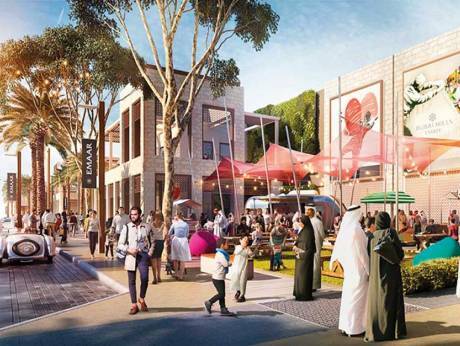 As such, the Dubai Hills Mall will look to offer “seamless access from Shaikh Zayed Road, Mohammad Bin Zayed Road, Umm Suqeim Road and Al Khail Road”, the developers said in a statement on Sunday. And, as is becoming the norm, the mall will also have a dedicated link to Dubai Metro and other public transportation. Dubai Hills Estate is to feature a green area of over 23 million square feet, which includes a golf course and a 1.9 million square feet central park. Around the golf course are the 4,400 plus villas and townhouses and 22,000 apartments. The wider MBR City is currently witness to multiple developer projects, and the scale is such that it will be one of the city’s future residential and commercial hubs, with Dubai South being the other. In recent months, the pace of off-plan launches there has picked up significant momentum, with price points that target the high-end to super-premium. The retail components — and the sheer size they offer — will add to the attraction.